The 2017 Hangar Exhibition, curated by Ahmad Humeid, presents work by local and regional designers in response to the theme of ‘movement’, whether physical, intellectual, cultural, or social. It showcases work that moves between extremes. The extremes of attitude: from the experimental to the practical. The extremes of impact: from the individual to the collective. The extremes of scale: from a letterform to the planet. The exhibition stands as testimony to how design challenges our contemporary reality, learns from it, adapts with it, and changes it - design that moves life and is moved by it. The Hangar was constructed in the 1930s to house the electricity generators that powered Jordan’s burgeoning capital city. Situated in a valley that is surrounded by Amman’s iconic hills, the structure is emblematic of the city’s modernization and industrialization, so much so that it became a landmark in its own right. 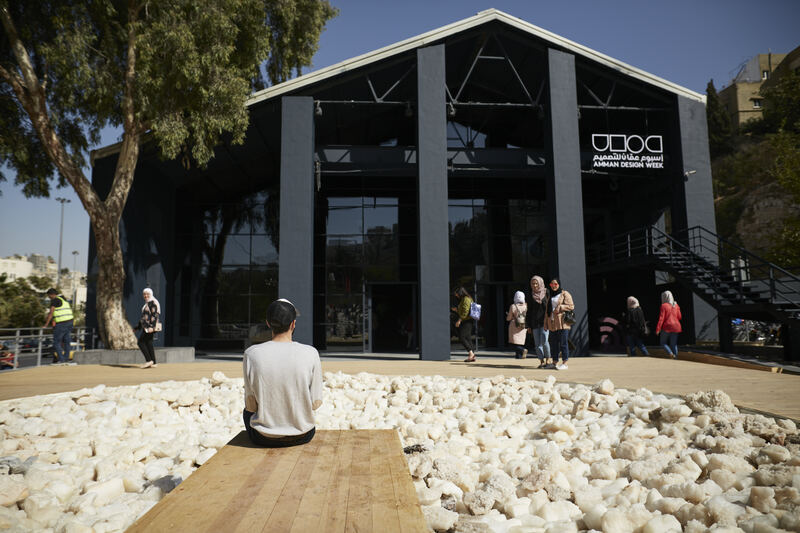 A rehabilitation by TURATH: Architecture & Urban Design consultants and the Greater Amman Municipality has transformed the striking building into a cultural space that plays host to exhibitions, fairs, lectures and more. How do you curate a design exhibition in the Jordan of 2017? We look around us and see immense social, economic, educational and environmental challenges. Further afield in our region we are surrounded by human tragedy, extremism and conflict. I call myself a “critical optimist”. I am a designer, after all. So, I understood Amman Design Week’s message this year as a rallying cry for the design community to use its creative power to be a driver of positive change and innovation in our always challenging, sometimes depressing context: Design Moves Life Moves Design. The call attracted over 300 submissions, a dazzling amount of work representing what design means in Jordan and the region today. Our small, dedicated curatorial team had the task to look within this body of work to seek projects, ideas and initiatives that reflected a spirit of motion: design that helps us move within our cities, design that moves our industries, design that moves our minds. Design that moves our senses. What you see in this exhibition is the result of our countless encounters with over 100 designers and design firms during the past eight months. As the curator of Amman Design Week’s Hangar Exhibition in 2017 I lived in a field of tension between my design ideals and realities on the ground. I am a firm believer that design in Jordan is a necessity and not a luxury. I look back and see the pioneering teachers and practitioners who taught me and inspired me at the University of Jordan. I see my peers in today’s creative Jordan. I see that rising generation of young designers just starting now. In all of them I see the accomplishments and potential of the “design movement” in Jordan and beyond. But my journey with Amman Design Week this year also exposed the great challenges facing our design industry and ecosystem of innovation, especially when considering the rapid pace of global change and innovation. My hope is that this exhibition shows the potential of design to citizens, government and industry. I hope it moves us forward. Ahmad Humeid is the founder and CEO of SYNTAX and is a designer, design advocate and entrepreneur immersed in issues of design practice, process, and technique. While still an architecture student at the University of Jordan, he launched his design career with his first design studio in 1991. Throughout the 1990s, he led design and technology efforts at various pioneering publishing, consulting and web ventures in the Arab region. In 1998, he founded SYNTAX, a design and innovation firm based in Amman. Working with companies, government agencies, and institutions, SYNTAX designs brands, products and services to ultimately create transformative experiences. SYNTAX combines the disciplines of research, strategy, communication, innovation, content creation, visual design, architecture and digital technologies.